Some days ago I got an archive full of font files and needed to decide which ones I'd keep and install and which to dump. I recently switched from KDE to Xfce - viewing fonts wasn't as easy as click-on-the-file since I uninstalled the KDE packages. 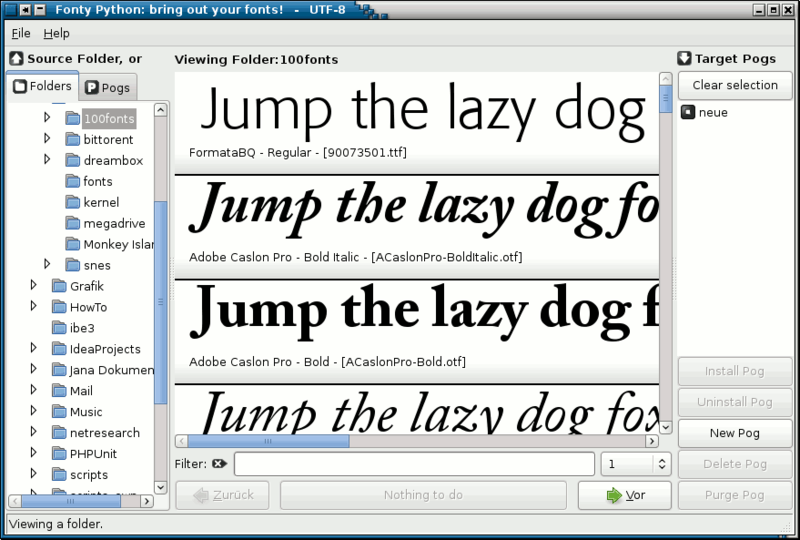 Here is a list of applications I found to be related to viewing fonts on Linux. Maybe they help you get a quick overview when doing the same as I had to. For the impatient: The winner is Fontmatrix. By the way: If you ever wondered how X and applications resolve color names to RGB values, the X man page (7) gave the answer: rgb.txt on your harddisk. It was in /usr/share/X11/rgb.txt for me. 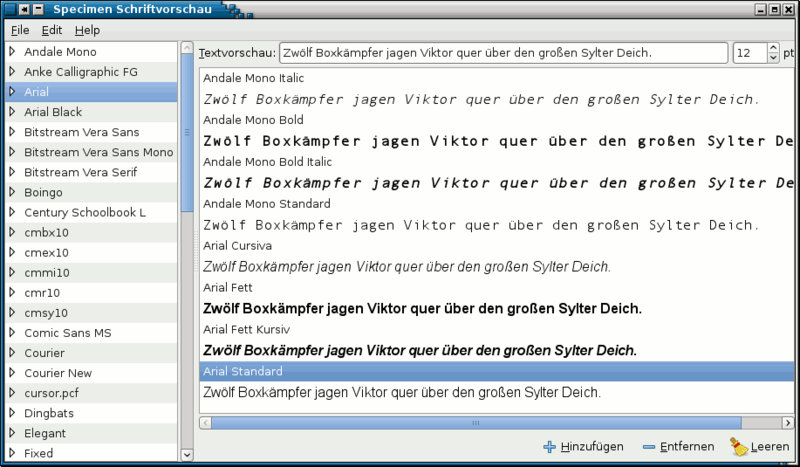 Gnome Specimen is a font previewer for Gnome. fontypython promises to be the tool I want: Made for designers with thousands of fonts, and allows you to categorize them into categories, or "POG"s as they call it. In reality, it really shows me all the fonts in the download folder - but paged to 10 fonts like a bad web page. Man, I have scrollbars! Scrollbars are a really better way to page data then prev/next buttons. So I set the page size to 1000 and here the trouble began: fontypython was slow as hell, maximizing the window and resizing the panes took about 10 seconds each - on a quite fast dual core processor. The categorization is a neat idea, but without major speed improvements, fontypython is not for me. Developers, use threads! Cache data! 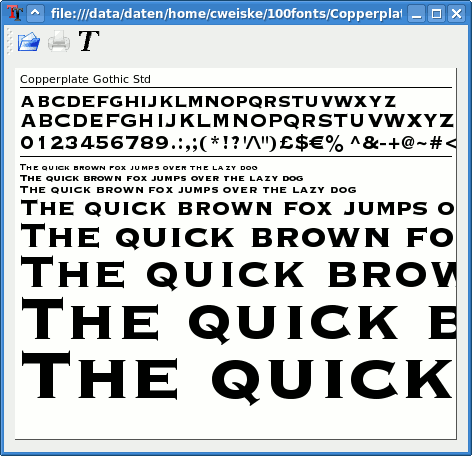 Opcion is a font tool written in Java and I discovered it at the end only. Being already brandmarked by fontypython in speed expectations, I was very impressed by its responsiveness. It doesn't do much - list installed fonts, list fonts in a folder (with paging like fontypython, but setting the page size to 1000 didn't make it that slow) and list favorites - but it does the job. When having hundreds of fonts, the preview listview scrollbar size does not match the amount of fonts. There also seemed to be a limit of about 200 or 250 fonts to display. The font installation help window doesn't have clickable links. A good example for a unix program that is just not understandable. I got a "fslsfonts: no font server defined" error. The first thing I do after such unhelpful error messages is to "-h" or "--help", but that tool does not have such a help display. You need to install xfs, the X font server for it. I never needed it, so I won't use fslsfonts. A classic X tool, but also only displays installed fonts. It does that in a way that is ok when you know the technical underlyings, but not for normal users. I always have trouble finding the right font with it. Despite the x in the name, xlsfonts only lists fonts available available on a given x font server on your terminal/console. 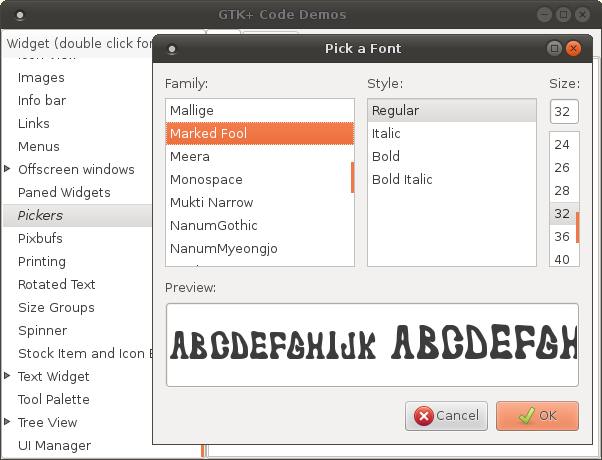 gtk2fontsel is the default Gtk font selection dialog in a standalone application. If your distribution does not have a package for it, try gtk-demo and go to Pickers - Font and you'll get the same dialog. For me, Opcion is the winner. 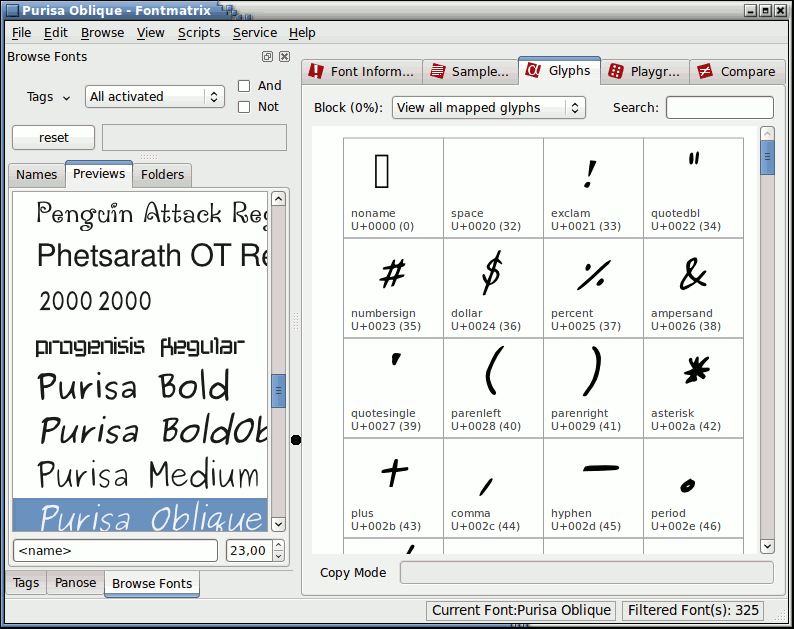 With some usability improvements, it's all I could ever wish for my font selection tasks. After discovering Fontmatrix, I'm not looking back to the others.